Built in 2007, Villa Camellia is a two bedroom, one bathroom villa with full air con. Fully tiled flooring and white washed wooden ceilings complete the light and airy feeling within. The front door leads you to the kitchen which is fully equipped with oven, hob, two fridges, dishwasher & microwave. The lounge/ dining area has a large L-shaped sofa which will convert to a sofa bed which will comfortably sleep two. Our dining table will seat six and we have also provided a high chair. The lounge has a flat-screen TV with Sky, wi-fi and DVD player with over 70 titles. We also have wi-fi available at no extra cost. We have provided children's toys suitable from birth upwards. A bookcase provides reading material for both adults and children. The bathroom has a bath with shower over and our washing machine sits behind the bathroom door, we have also provided a potty and step along with a portable child's loo seat. All of your bath towels are provided and are changed at times depending on the length of your stay. Our master bedroom has a double bed and countryside views, chest of drawers and plenty of wardrobe space, a hair-dryer and a set of hair straighteners. French doors lead to the rear patio area. Our twin room is next door to the master and has french doors which lead you to the front patio, this is furnished with a table and chairs and is a great spot to enjoy your morning cuppa. All of the windows in the bedrooms have built in mosquito nets which allow fresh air to circulate but keep the pests out! We have small children and are aware of the huge number of items that are needed when travelling with small children, we have provided a complete baby and toddler pack with over 30 items, some of which are, a full cot, not a travel cot which is complete with cot-top changer, baby monitors, Maxi-cosi car seats, sun blinds, baby steriliser, baby rocker and baby mat, swim aids, bath seat and many more items, we are happy to provide a full list on request. Our outside pool is kidney shaped and totally private for the guests staying in the villa, it will be cleaned each day and we have provided loungers and steamer chairs for the pool area. All of your pool/beach towels are provided for the length of your stay, We have a chest on the front patio which contains items for the pool and beach, buckets, spades, beach umbrella, swim aids and toys. The pool is not overlooked and offers shade during the day as the sun moves around. At the rear of the property you have a patio with countryside views, this has a table and chairs for 6 and a gas BBQ. A chest contains extra children's toys that can be used outside. For safety we have fenced our play area from the pool, children playing at the rear have no access to the pool from the garden that contains a small see-saw, swings and small slide, we also have astro-turf rather than stone fitted to protect the children whilst playing. The villa is within walking distance of the beach and tavernas and there are several supermarkets to keep you stocked during your stay. We are able to arrange car hire for you or can arrange a private transfer directly from the airport to the villa and back again. Our private transfers can arrange for car seats to be provided for your children when required. We have a local representative who is English speaking and is on hand to offer any advice and concerns that you may have during your stay. We are happy to answer any questions you may have. We are new to this site but have been renting the villa since 2007 and have several families that return year after year. We live in Chippenham a small town which is near Bath in the county of Wiltshire in the United Kingdom. We are a family of four, Paul is a full time fire-fighter and Kerrie a full time Mum to Harry and Niamh. We started to travel to Corfu in 2006 as Kerrie's Father Keith lives on the island, we fell in love with the island, the people and the food. We purchased the villa in 2007 and are lucky to have Keith who lives about 20 minutes from the villa and looks after all our guests. We are pleased to offer a discount to emergency services employees. As a family with small children we felt it was important to make the villa suit both adults and children, the items in our baby pack have been used time after time and we continue to add things we think will be of use. For those that are not familiar with independent travel we feel we offer a 'hand-holding' experience for those that feel they need it. The villa is in a great spot and St George is suited to couples and families as it does not have a great deal of night-life. We have got to know many of the taverna owners and the name of Mr Keith or indeed Harry might get you a better table! The benefit of not needing a car suits some and we therefore are happy to offer the private transfer for those who request it, prices are available and are dependant on the number in your party. We can also arrange for a car to be delivered to the villa for you should you require one for part of your stay. We booked this villa because of the positive reviews it had received and we were not disappointed. The villa is very clean, well equipped and in a peaceful location. The pool was perfect and the family of tortoises an added bonus. The are lots of places to eat within walking distance and we didn't have a bad meal during our two week stay. Kerrie and Paul who own the villa are very friendly and easy to deal with. We were looked after really well at the villa by Kieth who was happy to arrange car hire for us and was on hand if we needed anything, without being intrusive in any way. Our favourite restaurants were The Village which is just down the road and Malibu, which is a bit of a walk but the food and views are unbelievable. We also took a boat trip to Paxos which was fantastic, with swimming off the boat included. We even saw wild dolphins! I would be happy to recommend this villa to families or groups of friends alike. Just back from a 9 day stay at this lovely villa. Everything is as described or better and there are all the facilities anyone could need to make a perfect holiday. We were a party of 3 older people, but the villa is also equipped for young families. It is spacious,clean, tasteful and well maintained, with lots of seating areas. The lovely pool is a definite plus and Keith "Mr Fixit" keeps everything immaculate and is there to organise anything you need, from a special birthday night out to a hire car delivered to the door. Transfers can be organised so you don't necessarily need a car as there is a great beach 10 minutes walk from the door and enough tavernas to eat somewhere different every night for a month! The villa is in a tucked away location so no traffic to worry about but it is rural so there are chickens, goats etc nearby. There are several supermarkets in the village sufficient for everyday needs (the nearest is only 100 yards away) or if you really wish to self cater there are larger shops in nearby Lefkimi. For those with families who may not wish to stay out, a local taverna does very tasty and easy takeaways - Gyros Pitta at 2.50 euros means you don't really need to think about using the oven! Congratulations to Kerrie and Paul on such a lovely place. We would certainly recommend and hope to return ourselves. Fantastic Villa. A little luxury in the sun!! My wife, young son (8) and I enjoyed a fantastic stay at this Villa. The support provided by the owners in planning and stay throughout was just fantastic and we could not thank them enough for this - Thanks again ;-). The place was exactly as described, but now for my take; Spotless, homely and comfortable with a great and very clean pool just as you see it in the pictures. During our stay the property and when we required, we were supported by Keith (a Gentleman with a great smile). As a holidaymaker you could not ask for better. What I mean is...you were left to it, but if for any reason there was a need to take advice or the Villa needed anything at all then Keith was easily contacted. There are some fantastic places in the area for food and within the villa there are some nice guidelines on where to visit. I would recommend this villa as a great place to take a small family (there are even pool toys, games and books etc.). It is quiet and if it relaxation you are after in a beautiful and well cared for villa, then this is the place for you. Enjoy!! Booked a last minute holiday in June - literally the day before we flew! Luckily the villa was free. As a group of 20-22 year olds, it was perfect. The pool was amazing and we loved the tortoise. The villa was clean, tidy and fit for all age ranges. Theres a beach just down the road, along with a wide range of shops and restaurants. Perfect location spot. We loved it that much, we're going back in September and then June 2017! Must visit! A very comfortable home in a small paradise! 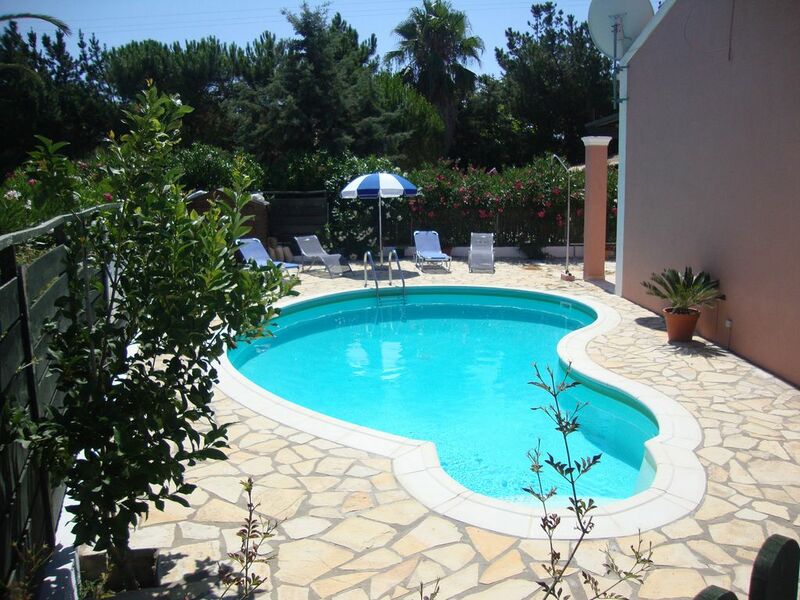 A lovely bright and well maintained villa which is close to shops, bars and tavernas. The Villa is so comfortable and caters for every need whether those with young kids or those of us who are a bit older! The owners and Keith are a delight cannot wait to go back again this summer! St George South is a small village located in the South of the beautiful island of Corfu. Villa Camellia is set within the village setting, close to the tavernas, supermarkets and beach but remaining in a quiet location at the end of a paved walkway. There are several tavernas set within the village and the villa has its own review book completed by past guests. Watersports are available on the beach, bikes (both pedal and motorized) can be hired and there are several coach and boat trips that can be booked for various trips around the island. Korission Lake which is within walking distance of the village is the largest lagoon in Corfu Island, Greece, part of a nature reserve with sand dunes, unique wild beaches, diverse plant and bird species. It is an important stop for migrating birds on their journey from Africa to Europe and at certain times of the year, over 2000 birds seek refuge in the Lake, including a wide variety of water birds, flamingos, swans and falcons. This is a beautiful and largely unspoilt region, with great walks, long soft sandy beaches and great scenery. A great day out is Aqualand which is loacted about 45 minutes drive from the villa, but coach trips are available from the village. Aqualand is equipped with all kinds of water attractions and has many facilities to make your day exciting until the last moment. Surrounded by green forests a total area of 75.000 square meters this water oasis will make your visit a truly pleasant and enjoyable even in the hottest days of the summer. Relax under the beautiful maple trees or enjoy the thrill of the multislides. Aqualand is acknowledged to be one of the best waterparks in Europe. Free sun beds and umbrellas, changing rooms and showers, high quality food, shops and free parking space are available in the waterpark. All of the qualified lifeguards will take care of safety and security of Aqualand visitors and will provide services for people with special needs. Children can play all day long in the pools as the water is filtered and cleaned daily. Elegant Corfu Town (also known as Kerkyra) leaves you spellbound from the moment you wander its cobbled streets aglow with evil eyes and redolent with sandalwood, past old ladies bedecked in widow-black robes measuring their afternoons with worry beads, washing strung from balconies. Corfu means ‘twin peaks’ – the town is bookended by two hills, on which two massive fortresses were built to repel the aggression of five successive Ottoman sieges. Besides some fascinating museums, there are plenty of upscale shops and some of the region's top restaurants to savour. Following the national road Corfu - Achilleion and turning left at Ponti, the twisting road ascends through the olive groves to the village of Agios Deka (the 10 Saints), and finally arriving in the village of Gastouri, passing the traditional houses with their attractive flower fill gardens, bougainvillea festooned walls and pergolas awash with colour, there is a hint of something special at the end of the road which unfolds itself at the imposing iron gates of the Achilleion Palace, which dominates a hilltop location.